Which is your favourite biscuit (or cookie, if you're from the USA)? Chocolate-chip, gingernut or oreo cookie? Oatmeal and raisin, black and white cookie, digestive or florentine? Biscuits and cookies have a myriad forms and flavours, and as well they have a rich and ancient history: evidence of biscuit-making exists from around 4000 BC. 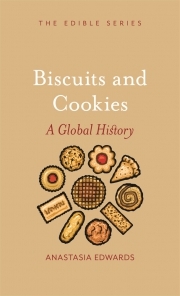 Biscuit/Cookie by Anastasia Edwards explores the abundant history of this versatile snack, from earliest beginnings through Middle Eastern baking to Northern Europe in the Middle Ages, and on into the New World. From German lebkuchen to the animal cracker, more than half-a-billion of which are produced each year in the United States alone. 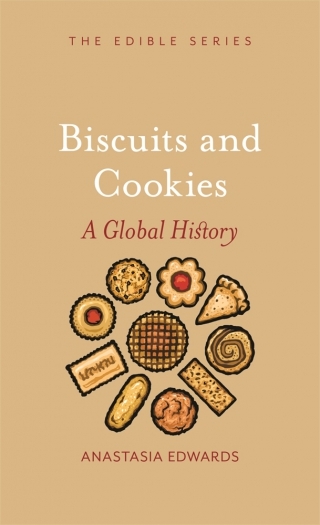 From brownies and sugar cookies in the US, to shortbread and rich tea biscuits in the UK, to Anzac and Girl-Guide biscuits in New Zealand and Australia, this book is crammed with biscuit and cookie facts, stories, images and recipes from around the world. Anastasia Edwards is a writer and food historian, and author of an anthology of writing about Saigon, Saigon: Mistress of the Mekong (2003). She lives in London.